Extreme Web Technologies – Extreme Web Technologies offer cheap hosting fees in Tanzania, providing quick and competent support in all issues. Their servers are located in the US. First Month Free Web Hosting! Register your perfect web address on .TZ and get one month of free web hosting — any plan! Mwezi wa kwanza, web hosting bure! Sajili jina la tovuti yako ya .TZ na pata mwezi wa kwanza web hosting bure – kifurushi yeyote! WPengine is the best choice in the world if you are looking for reliable, super fast WordPress hosting, with professional 24/7 live support! 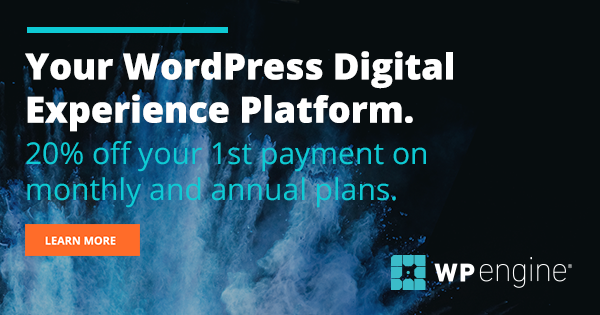 WPengine’s support staff will help you out with anything you need for your WordPress site. DreamHost has great hosting services, cheap prices and offers discounts on a regular basis. HostGator – HostGator offers Unlimited Storage, 24/7 Support, and most importantly: reliable hosting. Definitely worth trying, especially if you have to host gigabytes of files. A Small Orange – quick servers, physically located in the United States, very quick customer support (less than 30 minutes average e-mail response time), cPanel and tons of software included. Kili Host (formerly: Aptus Solutions) offers some of the the cheapest web hosting in Tanzania, reliable hosting service (99.9% uptime, physical server location in Tanzania), very quick and efficient e-mail support. If your website has lots of Tanzanian visitors, KiliHost is a great choice! All of these web hosting providers offer you free license to cPanel, the most popular software interface to manage your websites. KiliHost (formerly: Aptus) is the 2nd cheapest .co.tz domain registrar in Tanzania. NETIM – the best choice for European ccTLDs (e.g. .eu and European countries like .co.uk), offers promotions and discount codes on a regular basis. Dynadot – definitely the cheapest domain registrar for .com, .net, .org, .info, .uk, .me, .us., .ca, .cn and many more new gTLDs. It doesn’t have the quickest support but all issues are always solved. Also offers very cheap basic hosting, SSL certificates and free website builder. It accepts clients from Tanzania. GoDaddy – the biggest domain registrar in the United States, offers a wide range of ccTLDs. There are several aspects to consider if you want to choose the right web hosting package for your site in Tanzania. Depending on where your traffic comes from, you should host your website near your users; meaning that you should get web hosting in the country where most of your users come from. 1) if most of your visitors come from Tanzania, host your website in Tanzania. 2) if your visitors come from all around the world, host your website on a content delivery network. Most Tanzanian Internet users are on a very slow connection, and you want them to reach your site as fast as possible. Host your site in Tanzania. Site speed is one of the 200+ ranking factors which Google uses to determine the importance of your site for Web users. If your site loads within 4 seconds, you are considered “fast enough”. Slower site speed than 4 seconds is a minus. If your server is physically located in Tanzania, it’s close to your users and it will load quickly for them. If your server’s physical location is far away from your users, your sites will load slowly. The US has the best infrastructure and the cheapest web hosting prices in the world at the same time but if your visitors come from Tanzania, the bits and bytes have to travel all around the globe to reach your users, which will take significantly longer. Also, an IP address (=physical server location) in Tanzania might be an indication for Google that your website is “Tanzanian”, and it should rank well for Tanzanian users, but you can also set your website’s country of origin in Google Webmaster Tools. If you have an international target audience, a CDN (e.g. CloudFlare, MaxCDN) is probably the best way to host your sites. You won’t need to talk to a hosting provider’s support stuff often – but when you do, it will be urgent. So don’t choose a hosting provider with “we are closed on the weekends” attitude, because you will regret it on a Saturday when your website has an issue. Apart from that, 7-day-a-week live chat support is industry standard, so don’t go for less than that. For example, Extreme in Dar es Salaam offers customer support from 9am to 9pm on every day of the week. Imagine a network or servers spread across multiple geographic locations on our planet. It doesn’t matter where your web traffic comes from, the probabilities of being geographically close to your website visitors are a lot higher than sticking to only one physical location. You don’t have to be a technical genius to host your website on a CDN. On the contrary, the setup is super easy. CloudFlare offers a free plan which is optimal for small website owners who don’t get a lot of traffic. It comes with step-by-step setup instructions and you can get started in a matter of minutes at no cost. After using CloudFlare for a while, you will see how it works for your project and if it’s worth paying for an upgrade. 5 cents CDN – 5 Gigabytes for 5 cents sounds like a great deal, doesn’t it? You can also try any of these CDN services: Meta CDN, High Winds – “the fastest CDN on the planet”, CDN 77 – Start your Free Trial Now!, OVH, Key CDN, Cache Fly, Lime Light, and last but not least Bit Gravity a solution offered by TATA Network. AWS CloudFront – the biggest CDN provider worldwide, backed up by e-commerce giant Amazon. It requires highly skilled technical stuff to set up – definitely not recommended for beginners!